First-year Police Chief, Bill Scott, wasn’t the first thing San Francisco stole from Los Angeles. In 2009, the department opened their station doors to a community advisory board model followed by the Los Angeles Police Department. In theory, the city’s 10 district captains appoint a representative group of neighborhood stakeholders to meet, discuss community issues and take action to address them. The effectiveness of the community advisory boards has become a critical issue, because some on the citywide working group on community engagement see the boards as the citizen entity that will hold district stations accountable on instituting the Department of Justice reforms on community engagement. Moreover, they are the group of citizens who will have the ongoing responsibility of helping the police problem-solve. In addition, each district station has monthly community forums where anyone can participate, but the forums tend to attract neighbors concerned about immediate crime issues. The advisory boards are supposed to be stable, representative and more knowledgeable about a neighborhood’s issues. In practice, however, the community advisory boards are sometimes non-existent, highly informal and always difficult to access. If a citizen wants to join or find out who is representing the neighborhood, good luck. Only a few stations — the Tenderloin and Taraval — post this information on their websites. Commander David Lazar, who oversees community engagement, said the board meetings are open to the public, but only members can comment. Nevertheless, attending a community advisory board meeting is not easy. Meetings are not listed on the majority of the stations’ websites, and even district captains were sometimes confused about who could attend. At the Northern Station, Mission Local asked then-Captain John Jaimerena about the members on the community board, and he refused to answer. The meetings, he said, were private, and he would have to look more into it. When asked if the members on board were representative of the community, he said they were, but would not reveal their names. Many district captains were unsure if they were allowed to reveal the names of their voluntary board members. Mission Local waited weeks to get names of all the board members. They are public record — and knowing them can be helpful to residents. With all the lack of clarification that’s out there about the community boards, Commander Lazar said he is working on adding a Community Police Advisory Board tab to the SFPD’s website. He wants citizens to be informed about community boards so that they can participate. In surveying the district stations on the community police advisory boards, Mission Local found huge variations at each station. After months of asking, the SFPD responded with a list of members. Mission Station: If you dropped into the Mission Station community board, you’d hear radio silence. After the Department of Justice recommended that every station must have a community board, the Mission, under its second police captain this year, is still trying to get one in the works. Although an earlier captain said there was once an advisory board, no one could provide proof of its existence. Apparently, from the SFPD’s list, one is being assembled and, as the list below demonstrates, there are some names attached to the board. Bayview: In one of San Francisco’s most troubled districts, the station long held informal meetings with community stakeholders. 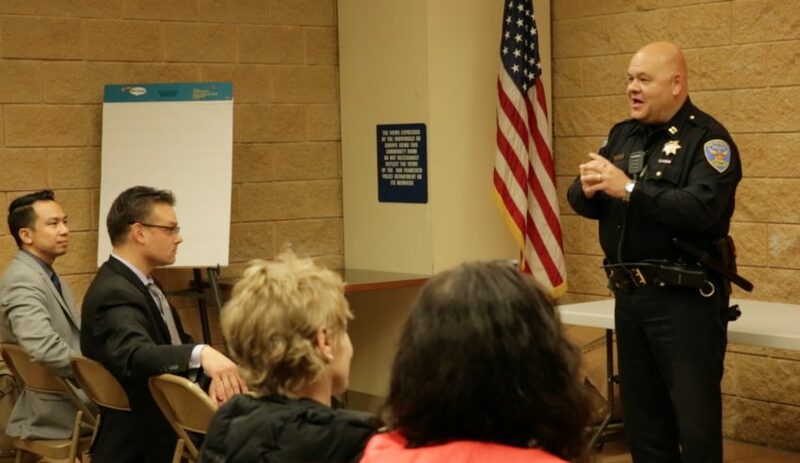 The new captain, Steve Ford, is trying to bring together a formal community board that can advise his department on how to more effectively address the SFPD’s needs. “This is something that I’m starting from scratch,” Ford said. “We’re starting fresh with goals and objectives.” The board of 12 to 15 business owners and residents met for the first time on Dec. 7 at 5 p.m.
Central Station: The community board has been one of the city’s most effective. When Lazar, who is now in charge of Community Engagement across the city, was Central Station Captain, it started the “Park Smart Campaign” as a deterrent for the district’s high number of car break-ins. Now, the Park Smart program is a citywide education campaign that teaches people how to protect themselves from vehicle break-ins. Troy Campbell is a Central District board member and the executive director of the Fisherman’s Wharf Community Benefit District. He’s seen four different captains over his six years on the board, and each has treated the board differently, which affects how the board works and what it does. Lazar revamped a board that offered plenty of complaints but no solutions. Under current Captain Paul Yep, the board splits into sub-committees that work on projects. The board has also worked on projects addressing money scams in Chinatown and organized the Central District’s National Night Out events. Ingleside Station: Current Ingleside Captain John Hart is new on the job. Hart has a diverse group of community board members — some citizens, some associated with merchant associations or groups like the Boys and Girls Club and SF Safe. Joelle Kenealey has been the chair of the Ingleside community board for the past four years. In that time, the Ingleside community board has coordinated community service events like gun buybacks. This event has since been taken over by citywide community organizations. The board meets the second Monday of every month at 6 p.m. at the Ingleside police station. Park Station: As one of the safest districts in San Francisco, little time is spent discussing how to solve crime. Instead, at a recent meeting, the group spent their hour talking about the heated citywide public meetings that discussed the proposal to equip officers with Tasers. Most of the 12 people in attendance voiced their support for Tasers. Meetings are held the third Monday of every month at 6 p.m. after the station’s monthly community meeting. On Feb. 5, the SFPD agreed to have the California Department of Justice step in to oversee its progress on 273 recommendations from a 2016 federal DOJ report. The agreement between the SFPD and the state comes after an unceremonious exit by President Donald Trump’s Department of Justice, headed by Attorney General Jeff Sessions. With California Attorney General Xavier Becerra looking over their shoulder, the SFPD appears to be open to suggestions. But if the point of a community advisory board is transparency and communication between the police and the community, the police haven’t been holding up their end of the bargain. Since few stations list their members, we asked the SFPD for a list of the members who participate on the Community Advisory Boards. That list is below. The author of this article did not do his homework. It is insulting and completely off target. I have been a member of Southern CPAB since its inception in 2009 and can say that Jaz Macmorna has never been a member. Nor has she ever attended a Southern CPAB meeting. We are a diverse group and have two African American members. Mission Local should be ashamed to employ such an unethical writer. Katy: Getting information on the CPAB’s was not easy. The list of board members was from the SFPD, but we will definitely recheck and correct. Thanks for the head’s up. Tracking the boards would be easier if their membership rosters were all posted on a single SFPD webpage. It’s an easy fix.